Making number cards is easy and can be really effective, especially for children. Children love to get their ages in bright bold colours, for all the world to see. They are really pleased about the years they tot up and even add the half or three quarters to it for added oomph! If you can draw freehand then use an A5 sized card and draw the number close to the spine, leaving some of the card attached. If you can't there are lots of templates around to give that special effect. These cards where made using templates from Imag-e-nation, and need I say it...well OK ...they where FREE! This card is joined on the left hand side, on the long and short edges of the five. Otherwise you end up with two seperate pieces....not good. 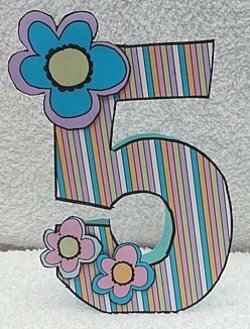 It was then covered in stripy paper and with a craft knife the five was cut round again. The edges are inked in black, for definition. The flowers are paper and attached with foam pads to stand proud of the card. Templates are good if you aren't confident in freehand and the number for this card was a free download from the internet. The template was placed on the front of the card and traced around. Then using a craft knife I carefully cut around it. The back, inside of the card is decorated as it can be seen through the number, and the flowers are just punched from glitter card and layered with foam pads. 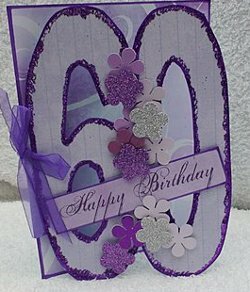 A magical card which can be made for any age!